From those initial Scrambler full tops, GR8TOPS has looked for the cool products that were missing from the Jeep aftermarket and today we still buy and sell different TJs and LJs to experiment with new product ideas and for displaying our existing product line. GR8TOPS even predicted the introduction of the LJ Unlimited Wranglers, buying a 97 TJ Sahara and stretching it 10” between the wheelwells well before the first LJ hit the showroom floor. 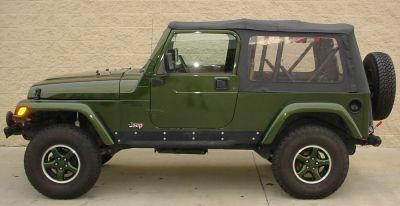 This platform gave GR8TOPS the perfect development vehicle for what became the LJ hardtops when they came out in the middle of ’03. Whatever your Jeep, we have a mission to help you “halfcab” it and make it a more useful and unique Jeep for you. The founder and initial president of the Scrambler Owners Association. The founder of CJ-8.com. The owner of 15 different Jeeps over 20 years. A Camp Jeep trail guide. A diehard Jeep lover. Matt Donaghy can’t trace the exact origin of his obsession with Jeeps, but that’s because it was so far back into childhood. 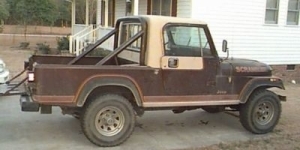 Full-scale adult obsession is easier to nail down, it started with a beat up 4-cylinder Wrangler in the early 90s that was supposed to be a toy but turned into a deeply loved rig that was driven constantly. The progression of the disease was rapid. The love for that YJ turned into another YJ and then spread to the “long” Jeeps. Matt found one of the “original” long Jeeps, the 81-86 Jeep CJ-8 Scramblers. After purchasing one as a fun older Jeep, Matt quickly found a unique attraction to the extra space and versatility of the Scramblers. cj8-trailrideMatt bought and completely resto-modded an ‘82 Scrambler from the frame up. It was transformed into a custom ride shown in this trail shot. The process of restoring that Scrambler led Matt to start the website CJ-8.COM which is now the authoritative Scrambler resource on the web and boasts a thriving community of over 10,000 CJ-8 owners and enthusiasts from around the globe. Not willing to stop there, Matt also founded and served as the first president of the Scrambler Owners Association, a national non-profit club dedicated to the CJ-8. 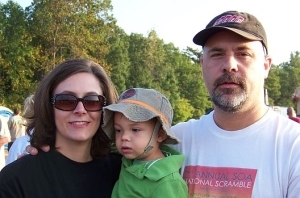 Matt helped conceive and organize the inaugural National Scramble event that is held every summer for trail riding and meeting of Scrambler owners. The event is going on its 7th year in 2010. Matt attends multiple Jeep events every year with GR8TOPS and just for the fun of trail riding and hanging out with other Jeep owners. He is blessed with a wonderful wife, Nicole, and two sons Cooper and Sawyer. 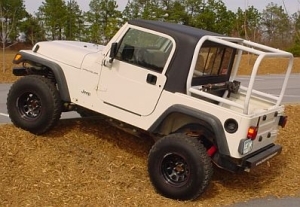 Over the years GR8TOPS and Matt have become synonymous with the ORIGINAL half hardtop company for Jeeps and the foremost expert on how to create a halfcab truck out of your Jeep Wrangler LJ, TJ, CJ or YJ.